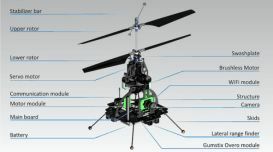 The Coax helicopter is an open, cost-effective and easy to use system. Educational applications include' autonomous navigation, non-linear systems, system linearization, frequency domain analysis, estimation theory, Hardware in the loop (HIL), multivariate systems control dynamics modeling and identification. Max. Height 6 m (19.6 ft) if only the on-board sonar is used. Up to the user if the pressure sensor is used. © 2010, AAI Canada, Inc.